This week a beautiful crib sheet arrived in the mail!! Thanks to Jessica for the gift : ) It’s hard to tell in the photos because the sun was so bright, but it’s a pretty mist seafoam blue. We’ve had an empty white mattress in the nursery for months, so I was so excited to put some color on the crib. What I didn’t anticipate was how hard it is to change a crib sheet! If you think making a queen size bed is hard…my gosh this was much harder to maneuver. I know the tightness is very important for baby’s safety though, but I had to really pinch my hand in there to lift up the mattress and put the sheet on. Hard also to bend over and lift a heavy mattress with a big belly in the way! Boppy and sleepy sound sheep were hand-me-downs from a local Twitter friend! Thanks Greg! One step closer to a baby friendly bed! 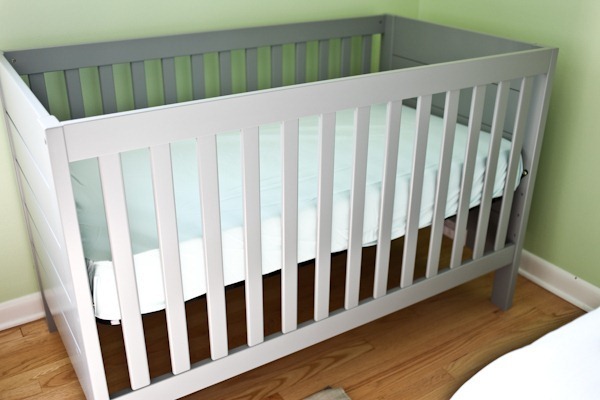 Don’t you think it might be easier to lift the mattress up between the slats from the outside of the crib? Changing the crib sheet is tricky! I usually just lift out the whole mattress, set it on the floor vertically and change the sheet that way. Then just heave it back over the rail and into place. If you use a bumper (which I don’t recommend) it’s next to impossible!! Def agree – take the mattress out completely to change a sheet. I don’t like the “trick” of layering. It seems to be more tricky than just pulling it out. And I DO use a bumper pad! Gasp! Yes, definately lift up the mattress – one side, then the next – and it should be a breeze. I agree with the comment above! I use those breathable bumpers though & they stay in place nicely. Not to burst your bubble but when my daughter was 32 weeks she was 7 months & 11 days old. So the whole “32 weeks = 8 months” thing isn’t quite right. I’m going by the typical doctor’s office weeks not fetal age, which no one uses. The point is that 4 weeks =\= one month. If it did, we would have 13 months in a year 52/4 = 13). Sorry, I guess I should clarify, I meant after she was born. Her birthday was on Sept 19th (a Monday). Thirty two Mondays later was April 30th (11 days after she turned 7 months). 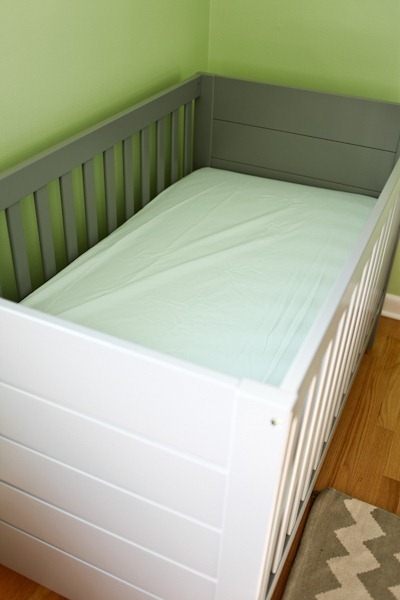 I used zip off crib sheets and they were great!!! I take the mattress out of the crib to put the fitted sheet on. So much easier! 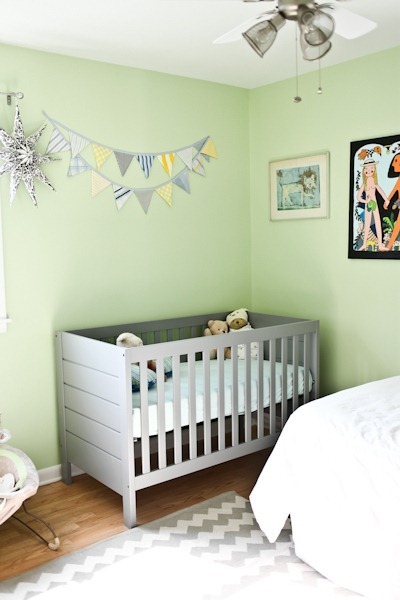 I just absolutely love how inviting and airy that nursery “feels” in your photos. What a wonderful place – and what a sweet gift from your friend Jessica! Matches the decor perfectly. I love those sheep! If it’s the one I’m thinking about, they have the cool heartbeat woosh. I just think they’re neat because of how familiar and comforting the sound must be to the baby. The nursery looks great, btw! What’s the layering trick for blowouts? Hahahahaha- I think I know your Twitter friend, Greg. I met him one summer at camp in high school out here in Socal and have remained in contact since. Such a nice guy. Small world! You’re probably going to need a lot more crib sheets…you end up changing them way more than you realize (diaper leaks, spit up, etc…). You’ll need some extras to put back on the crib while dirty ones are in the laundry. 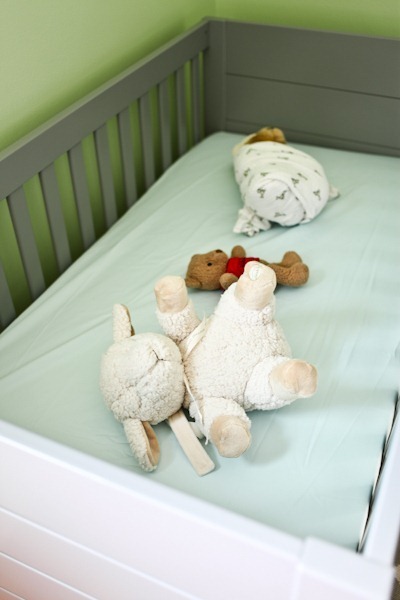 Also, make sure you wash the new sheets before baby sleeps on them…there are lots of chemicals in new fabrics that will irritate sensitive baby skin! Oh I know – I hope to have quite a few sets in time. And I will be washing them – just wanted to test it out for size! Don’t want to wash just one sheet, so I’ve been saving a lot of the baby stuff to wash at once. I did not layer, I just had several sets of sheets . 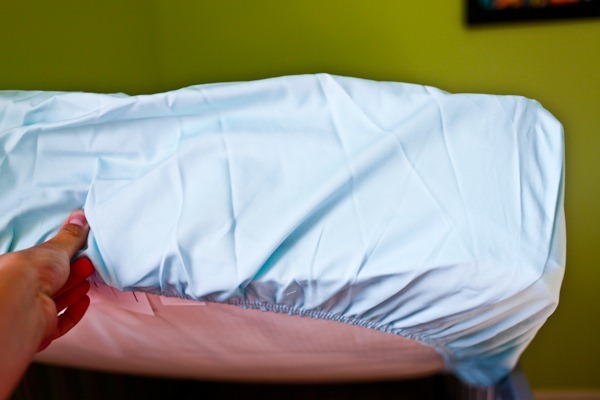 Our sheets always got dirty from spit up instead of potty leaks, But every baby is different. I used a bumper for the first, but not the second, I just felt they didn’t serve much purpose. I also recommend the plastic changing pad without a cover. We always ended up with messes and it was much easier to clean without a cover. It’s Eve of Adam & Eve! There were days when I changed crib sheets 2 or 3x in a 24 hr period. It happens. 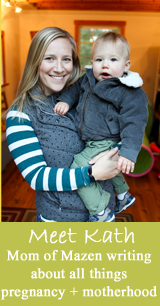 Between spit-up, blowouts, and everything else, you’ll get lots of practice. Make sure you have AT LEAST 3 crib sheets. There were also times I literally had 2 in the wash and 1 on the crib. And make sure you have at least a couple waterproof matress pads, too. Because those get taken down with the cribsheets in the event of blowouts and such…the things you don’t think about til it’s 3am and you need them! I swear by the Quick Zip sheets. They are so easy to change. You’ll be happy you registered for them, Brie! Have you heard of the Ultimate Crib Sheet? We have those and lay it on the crib sheet and then you never have to change the crib sheet. It’s white but you only see it from above. From the sides, you see your own crib sheet. The Ultimate Crib Sheet snaps around the bars and is easier to change. Also waterproof, which is the point. We have literally never changed the crib sheet, just the top. Love that color combination – very ‘calm beach.’. 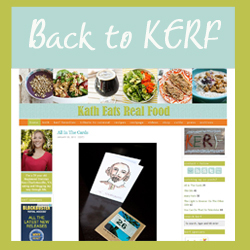 Off topic, though, I have a question for you and any other readers – how many calories would you say you approximately eat per day in the third trimester? I’m 29 weeks pregnant myself, and my OB just sent me to a nutritionist since I have only gained 8 pounds so far (started at 5’6″, 130 pounds). I would guess that I eat around 1900/ 2000 calories per day. I eat whole, vegetarian foods, including cheese and eggs. I graze throughout the day, and never leave myself hungry. Am I way off? Are you exercising too? If you’re in the third trimester, caloric needs go up to 450ish. Plus your regular needs, plus any exercise. 1900-2000 does sound low to me. I’m not counting, but I’ve gained right on the low end of the normal recommendation for me, so my doctors say I’m eating the right amount. Seeing the dietitian will probably be very helpful. Crib sheets can be hard to change. Our daughter is still using the same crib mattress on a daybed, and I still find it somewhat cumbersome to change. 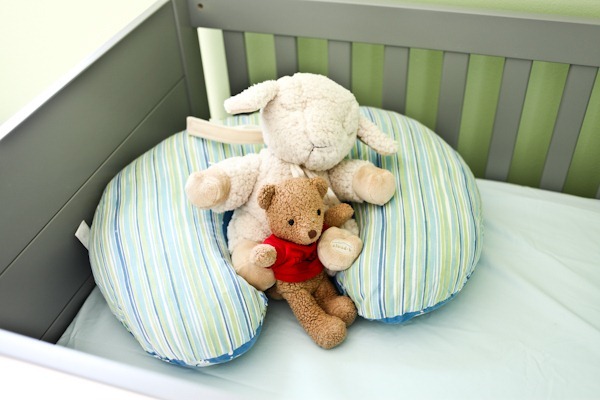 Our daughter’s crib is a 3-in-1, which means it can be a crib, a daybed, or a regular bed. It is a daybed right now, but will be the baby’s crib once he is born. Our daughter will then transition to a big girl bed. We have 3 crib sheets, and have yet to (knock on wood) have a blowout that warranted a midnight changing of the sheets. He did have a serios spit up episode once in the middle of the night. I decided I couldn’t be bothered with changing the sheet, and just brought him back to bed with us. Hi – You may have already heard this, but I strongly suggest you get 2 Ultimate Crib Sheets (got mine at BRU). They are flat and snap around the bars of the crib. You may never have to change the actual crib sheet! So much easier. Where did you get your crib? Love it! 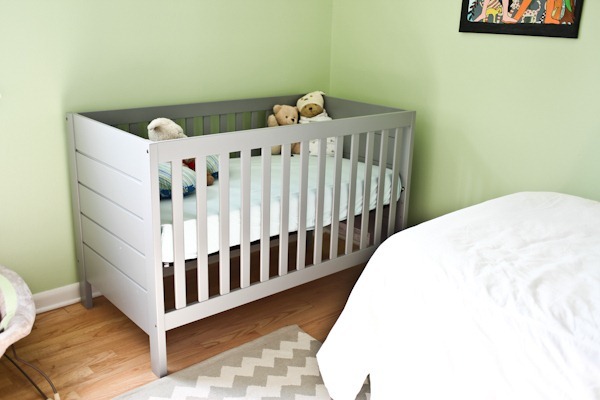 We use the QuickZip crib sheets and they are amazing! No lifting the mattress, no fumbling with securing it down, just zip zip zip. They are amazing, but really make a difference at 3 a.m. when you need the quickest sheet change imaginable.